The Arkyd 3 Reflight (A3R) technology demonstration spacecraft is shown before launching to the International Space Station. Image released April 14, 2015. The nascent asteroid-mining industry is set to take its first steps into space this summer. Planetary Resources' Arkyd-3R probe currently sits aboard the International Space Station and is scheduled to be deployed sometime in July, representatives of the Washington-based asteroid-mining company have said. 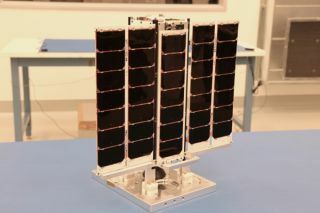 "During its 90-day Earth-orbiting mission, it will send back data on the health of its subsystems to our team at our headquarters in Redmond, Washington, and complete its mission with a fiery re-entry into Earth’s atmosphere as a result of its natural atmospheric orbital decay," Planetary Resources representatives wrote shortly after the Arkyd-3R reached the orbiting lab aboard SpaceX's robotic Dragon cargo capsule last month. The people behind Planetary Resources, and another outfit called Deep Space Industries, aim to help humanity extend its presence out into the solar system by tapping asteroid resources such as water and precious metals — while making a nice profit along the way, of course. Water may be key to the entire enterprise, because the stuff can be split into hydrogen and oxygen, the chief components of rocket fuel. Asteroid mining could thus lead to the establishment of in-space propellant depots that allow voyaging spaceships to fill their tanks up on the go, and relatively cheaply, advocates say. Planetary Resources aims to achieve its grand vision via a series of incremental steps. For example, the Arkyd-3R — a cubesat that's just the size of a loaf of bread — should be followed into space by the larger Arkyd-6 later this year, company representatives said. The Arkyd-6 is twice as big as the Arkyd-3R and is part of a line of "ScienceCraft" that "we’ll use not only to test the scientific instruments and deep-space technologies at the heart of our asteroid-prospecting missions, but to also provide a platform that will allow others to fly their mission with our technology," Planetary Resources representatives wrote. A future spacecraft called the Arkyd-100 will demonstrate asteroid-observation techniques and technologies from Earth orbit; thereafter, the plan calls for sending other probes out to study space rocks up close. "We look forward to many flights of the Arkyd series spacecraft, in Earth orbit, to asteroids and wherever they can be of service," company representatives wrote.